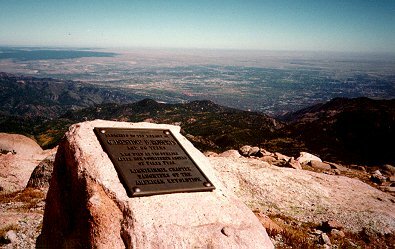 On Sunday, September 4th, 1955, Inestine B. Roberts took a bus across town to the Manitou Springs Incline. She rode the Incline and then proceeded to hike to Barr Camp where she made it in time for a steak dinner after which she spent the night. The following morning (Labor Day) she continued up the mountain where she spent the night in the summit house. The next morning she started back down the mountain but arrived at the Incline 15 minutes too late to get a ride down. Not wanting to hike down in the dark she spent her 3rd night on the mountain before arriving back at her home. Thus ended the 13th ascent of Pikes Peak for Mrs. Roberts. To me what makes Mrs. Roberts’ story so interesting is that much of what is known about her we know from before that fateful trip because she was a well known and remarkable individual. Her 13th ascent, which this story opened with, took place just 5 days before her 86th birthday. Mrs. Roberts was born in 1869 in Smethport, Pennsylvania. She was the daughter of a lumberman and saw mill operator and often hiked with her father thru the woods and foothills of the Allegheny Mountains which started her passion for hiking and climbing. She was 5 feet tall and weighed 89 pounds. She was a member of the Bird society, the Historical society, the Mineralogical society and was a member of the DAR (Daughters of the American Revolution). She was also a hike leader and member of the Colorado Mountain Club. She was an expert on plant life and knew about 200 different trees. She pointed out that at her age that just meant learning 2 or 3 trees per year. In part I Inestine B. Roberts was introduced through her 13th ascent of Pikes Peak, which she completed just before her 86th birthday. Almost 2 years later on Saturday, August 3rd, 1957, she took off for 14th ascent of the mountain. As mentioned in part I, it started out the same as her last trip and she arrived at Barr Camp where she signed the registry at around 5:45pm. She left for the summit the following morning at about 6am stating that she would be spending the night on the summit. This is where her plans went awry. There are several reports of an disagreement which took place in the summit house. Although several witnesses heard her say that she “had known for twenty years, she could always have lodging at the Summit house” she would not be allowed to spend the night. It was also reported that she refused several rides down the mountain preferring to walk down as she had gone up. The end result is that Mrs. Roberts left the summit in a “huff” at around 5pm on Sunday, August 4th, amid clouds and chilly weather. A summit worker, Samuel Melugin, left with her to assist her but this assistance was also refused. Melugin returned to the summit and got a heavier coat and headed back down the trail. Darkness and a storm were fast approaching. It was reported that he practically ran all the way to Barr Camp through the storm. However he never saw Mrs. Roberts. Although he was exhausted he borrowed a flashlight and a dry jacket and proceeded into the night, presumably to the Incline Station where the coat and flashlight were later recovered. The following morning, Monday, August 5th, the manager of the summit house called the sheriff’s office via his “mobile automobile telephone.” Mr. Carl asked if they could find out if Mrs. Roberts made it safely to Barr Camp. This was relayed on to B.A. Fritts, owner of a burro firm, who road in to the camp that night. He learned that Mrs. Roberts had not made it. However she had been seen by several that day high up on the mountain. She had apparently spent the night under a rock overhang. She was last seen at 3pm by Monte Wolford who was training for that Friday’s Pikes Peak or Bust Marathon having won the previous year’s Pikes Peak Sesquicentennial Marathon. (By 1959 these fancy names were dropped in favor of the more familiar name of Pikes Peak Marathon.) Wolford said that he saw Mrs. Roberts just above Timberline and she had remarked that she “would be glad to get down to Barr Camp for shelter and food tonight.” Wolford also reported that she appeared to be cutting switchbacks but otherwise seemed fine. Wolford, Fritts and Garry Holiday, a guide for Fritts, headed back out and searched for 2 1/2 hours for Mrs. Roberts in the dark. They found nothing and Wolford sprained his ankle in the dark. The next morning, Tuesday, August 6th, Fritts returned to telephone the sheriff’s office his report. Sheriff Earl Sullivan ordered out the Sheriff’s Posse to begin a search. Eight mounted members of the posse headed up the Barr Trail Tuesday afternoon. By 6pm it was reported that four members had reached Timberline without finding a trace of Mrs. Roberts. They returned to Barr Camp for the night. On Wednesday, August 7th, at 8:30am two Civil Air Patrol planes were sent to the aid of the search. At the same time, six Ft. Carson soldiers with mountain experience and rations for five days headed to the summit via truck. They reached Barr Camp that night where all the searches mapped out plans for the following day. This included a search of the Bottomless Pit area where some felt that because of her numerous climbs on the mountain Mrs. Roberts may have known of a cabin located there. In the meantime, water was being left along the trail in case she found her way. Thursday, August 7th, did not go much better for the search despite the swelling number of searchers. On Friday, August 8th, 15 runners headed up the mountain for the 2nd annual marathon on Pikes Peak. Wolford won again and despite his still sore ankle he beat his previous year’s time by 24 minutes and 5 seconds as well as the 8 other finishers in the process. While the race was taking place foot searchers split into two groups and covered 20 miles in a “foot-soreing” hunt, again to no avail. On Saturday, August 9th, about 100 members of the Jeep Posse drove to the summit to aid in the search. By the following Wednesday, August 14th even more had joined in the search. At 7am, 23 mounted searchers and 41 foot searches started an inch by inch search of the area within a one mile radius of the Timberline Cabin. Twenty of the searches split into two groups and headed down on either side of Cabin creek which originates at the cabin. At 8:12am, five gunshots were fired into the air. The search was over. Mrs. Roberts body was found in an area that was almost inaccessible by foot. It was 100 yards above the creek itself and about one mile east of the Timberline Cabin and about 450 yards away from the Barr Trail. It appeared as if she tripped and fell 30 yards down the side of the slope because her hat was found above the spot where she was found. She was face down with her head cuddled over her arms. Her coat was found beneath her and was still over one arm. Her knapsack and a small, broken, clear plastic container of Alpine flowers were found near her body. The container was most likely broken in the fall. Even after what must have been a harrowing night on the mountain she still appeared to be collecting flowers for the flower show that the Pikes Peak Garden Club put on in the City Auditorium a few days after she was to return. Although both the Cog and the Incline had offered assistance, her body was brought all the way down the Barr Trail on horseback. The coroner reported that there were no broken bones or serious injuries and that Mrs. Roberts most likely died of exposure after her fall. She was a month shy of turning 88 and left behind six children, six grandchildren and 10 great grandchildren. 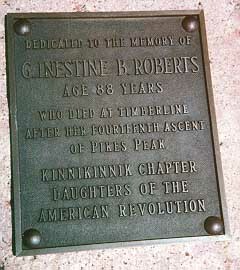 That is the story of how there came to be a memorial to Inestine B. Roberts just above the treeline on the Barr Trail. I no longer pass by the memorial without giving thought to her remarkable life and her unfortunate death. However, one can’t help but think that she would be happy with the spot where her memorial was placed.